Aaron Rodgers losing sleep over struggling Packers’ offense? Aaron Rodgers and the Green Bay Packers pulled out a 24-10 win over the Rams on Sunday, but the quarterback thinks the offense is struggling and might lose sleep over it. The Green Bay Packers are undefeated, yet quarterback Aaron Rodgers is so dissatisfied with how the offense has performed the past couple of weeks that he intimated he’s losing sleep thinking about it. Speaking with reporters after Sunday’s win at home over the St. Louis Rams, Rodgers praised the team’s defense for keeping things going in the meantime. Four of 13 on third down. Three giveaways, which included two Rodgers interceptions and a Rodgers fumble. After throwing 10 touchdowns with no interceptions the first three weeks of the season, Rodgers has struggled, relatively speaking, the past two weeks, throwing for 465 yards and three touchdowns. Additionally, as many are likely aware, he finally threw an interception at Lambeau Field, breaking a 586-attempt streak that started in Dec. of 2012, and then threw another one shortly afterwards. His first interception was a result of a tipped pass, however, which is always fluky, but the second was just an outstanding play by Trumaine Johnson. Furthermore, he’s working with a severely depleted receiving corps that lost Jordy Nelson before the season, has been missing Davante Adams and that has seen Randall Cobb fighting a shoulder injury. 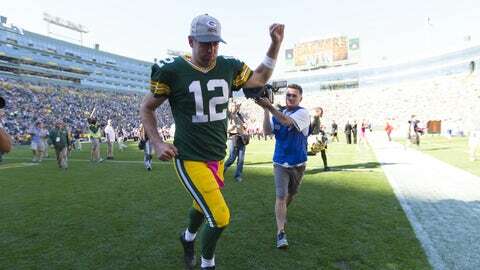 Rest assured, Rodgers is going to be just fine over the long haul. On the season, he is still tied with the league lead with 13 passing touchdowns and is second only behind Tom Brady in passer rating. And, as he mentioned, the team’s defense has been outstanding of late. While nobody would mistake the San Francisco 49ers and St. Louis Rams as top offensive franchises, Green Bay’s defense held the two teams to a combined 13 points the past two weekends, creating five turnovers and tallying nine sacks. The Packers are just one of six NFL teams without a loss heading into Week 6. Rodgers will rebound, as he always does, and it might be another 586 attempts before we see him throw another pick at Lambeau. That said, the fact that he might literally be losing sleep over a couple of sub-par performances is just another example of what makes him the best quarterback in the NFL.